Halloween fever is all around us with ghoulish decor, sweet candy, and pumpkin carving to boot! As it turns out I have an unrelated fever, and this one’s got me feeling like the living dead. Seasonal germs are already making their rounds, and when you’re sick nothing seems festive—especially in the kitchen. When depleted, cooking is too much effort, and take-out seems a more inviting alternative. Yet, when illness trick-or-treats at your door, there is never a more important time to fuel yourself with healthy options (I guess that means candy corns don’t count). It can be as simple as a nutrient-packed pasta dish, ready in a minutes. Though antibiotics, Emergen-C packets & cough drops are there to get you back-to-better, you can help boost your immune system with fresh ingredients you probably have in your kitchen right now. Antibiotics can totally sap your energy while they work, so here’s what I do to help reclaim mine. . . .
Garlic – Several months ago I did a post featuring the health benefits of garlic, and some easy ways to prepare it, Garlic the Great. I love garlic and cook with it almost daily, but it is much more than just an appetite booster! My former post goes into some great garlicky detail, but I turn to it again now because it posses significant antimicrobial & antibacterial properties. It is also very rich in the antioxidants manganese & Vitamin B6. 1 oz of raw garlic gives us all we need for our Daily Value’s (DV) worth. So, we’re going extra heavy on the garlic in this pasta. Spinach – I incorporate spinach into my diet a few times per week, and love it raw or steamed. When I am under-the-weather, I try to make it a point to increase my spinach consumption, because this leafy green has much more than just iron to offer! Spinach is one of the most nutrient dense foods on the planet. If you can pick just one healthy veggie, this is high i=on the list! 1 cup of cooked, fresh baby spinach has an abundance of antioxidants & phytonutrients (like flavonoids & carotenoids such as Beta-carotene). Spinach possesses a nice brag sheet—1 cup cooked gets you over 1000% DV Vitamin K, 377% of your Vitamin A, 84% Manganese, and 30% Vitamin C. The list goes on-and-on, but the aforementioned are specifically good at building-up your immune arsenal! Tomatoes – Well besides loving them tasre-wise in most dishes (let’s be honest here, I mostly love them in ketchup), 1 cup of raw tomato gets you similar phytonutrients as spinach, such as your flavonoids and carotenoids, but the lycopene in tomatoes shows increasing benefit as an antioxidant and anti-inflmmatory. Additionally, you’ll get over 38% DV of Vitamin C from that one cup, 30% Vitamin A, and over 11% potassium. Last, but certainly not least, we’ll be adding fresh lemon zest, lemon juice and fresh basil into our pep-you-up pasta. Lemons are known as an excellent source of Vitamin C with over 46% in 1/4 cup of juice. Additionally, they possess flavanoid compunds shown in studies to have antioxidant properties. Our flavorful & aromatic basil offers over 60% DV of Vitamin K in 2 tsp worth. Interestingly enough, the volatile oils in basil have been clinically shown to inhibit growth of several common & dominant bacterial strains, such as Staph & Listeria. Who’d have thought my garnish was so potent?! 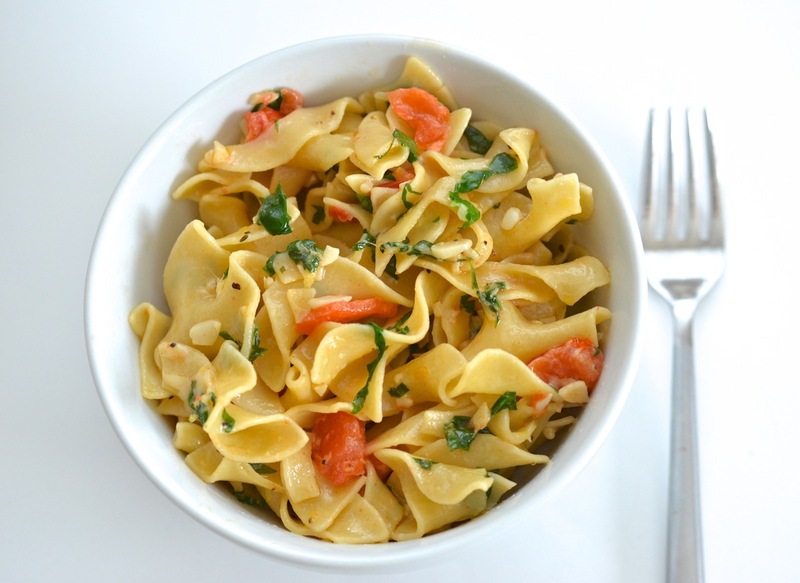 Ok, we know why it’s good for us, now let’s get down to germ-obliterating business with a simple & quick recipe: Get-Well Garlic Pasta (with fresh spinach, tomato, lemon & basil). This Get Well Garlic Pasta - with fresh spinach, tomato, lemon & basil, packs just the punch necessary to help you combat seasonal germs when you're under the weather! Mild & delicious, this pasta dish is simple and full of nutrient dense ingredients, that's easy to do in 15 minutes, even when you're sick! This makes for an easy and delicious weeknight meal no matter how you're feeling! Boil egg noodles till tender, about 9 minutes, drain in colander, and rinse with hot water, and let drain. Peel garlic and smash cloves with flat blade of Chefs knife to release their enzymes, and chop smashed cloves finely, letting them sit for several minutes for maximum benefit! Return emptied pasta pot to low heat on stove, and add 1 tsp of the EVOO & garlic to sauté on low for 1 min, avoid browning. Add butter, pasta & combine coating well on low heat. To the pot add lemon zest, lemon juice, parmesan cheese, S&P, chopped spinach & tomato, stirring well. Add lid to pot and let pasta heat on very low to allow spinach to wilt down (will only take a few seconds since it was chopped thinly). Add basil, season with more S&P to taste, and serve immediately. *Serve with wedge of lemon to squeeze on top of pasta as desired. This one is super simple and contains specific ingredients that help fortify your immune system! It is purposefully mild to be easier on the stomach when you're feeling ill, but if you want to pep it up, you can add in some more spice! Any pasta choice will work well, but I like the texture of the egg noodles. Add more or spinach or cheese to your preference! Enjoy. We went heavier on the garlic this time, so vampires (and significant others) be warned! You don’t have to over exert yourself to make this easy dish and you can feed the crew while you’re at it. It may not be solve every ailment, but it will sure help put you back on track— and it tastes pretty darn good in the process. Here’s to staying well, while eating well!